If you follow me on Instagram, then you know we’ve spent a good part of our summer updating and upgrading our new home’s kitchen. Today I’m sharing our kitchen decor update, even though I’m not quite ready to show the before and after photos:) I want to make sure I have all of the decorations in place first! One by one I’ve been arranging and rearranging lots of things until I feel like it looks just right. Everything still looks kind of bare, but I’d rather not rush any decorating and then regret purchases, ya know? 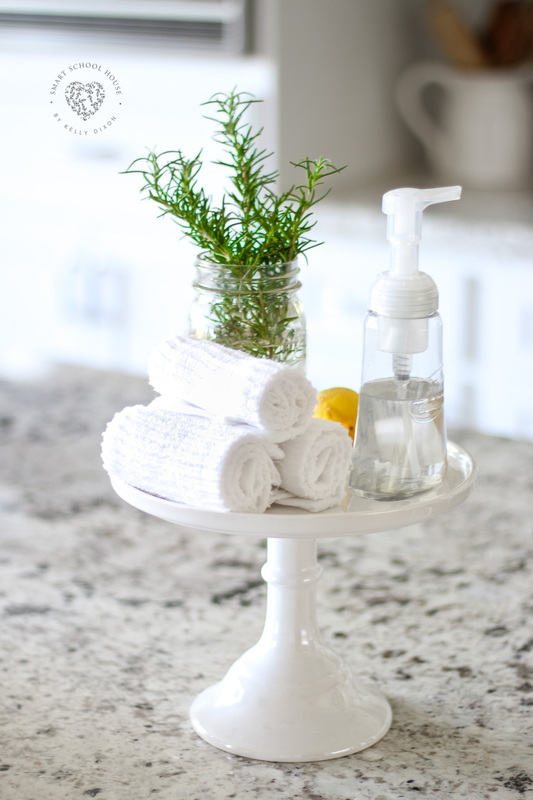 So, today I’m sharing the simple things I’ve used as decorations in the kitchen. I didn’t buy anything new yet, I just used what I had. Some things were from our old house that I couldn’t find a place for. I’m glad I’ve found a way to use that stuff! For example, I had some silk flowers that I loved in our old kitchen. However, the hanging baskets that they were in (seen in the kitchen picture here) just don’t fit anywhere in our new kitchen. 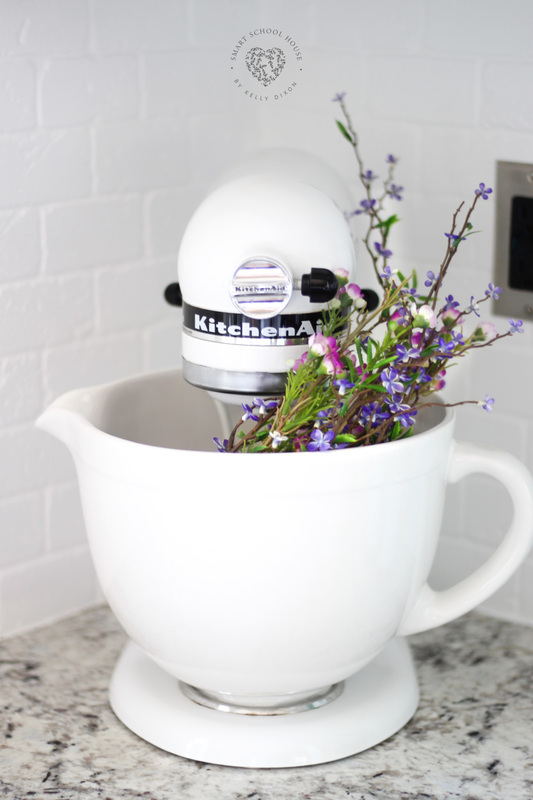 Instead, I took the flowers and placed the inside of my white Kitchen Aid Mixer. I absolutely love the character and charm it adds to my otherwise plain white stand mixer. I think it’s a great pop of color in the corner. This is a cake stand that I’ve had for awhile! It’s just been hidden behind cupboard doors. But, I really love it! Instead of hiding it away for when we’re entertaining, I wanted to use it somehow. We have a very large kitchen island (which you will see in before and after photos or you can see in my “lifestyle” highlights on my Instagram). …use what you already have first! It’s no secret that we have two kids here at Smart School House. I know that you could put pasta in these clear jars, but I thought I would do something a little more fun for the kids. I considered stacking cookies in them, but wasn’t sure if that’s exactly what I wanted to do. Instead, I opted to put some plain Cheerios in one jar and some Lucky Charms in the smaller glass jar. Why Lucky Charms? Because I can LOL! When I was a kid, I loved them. I loved when my mom would surprise us with sugary cereals that tasted soooo good! It’s not every morning that the kids eat Lucky Charms, but here and there… I have no problem with it! 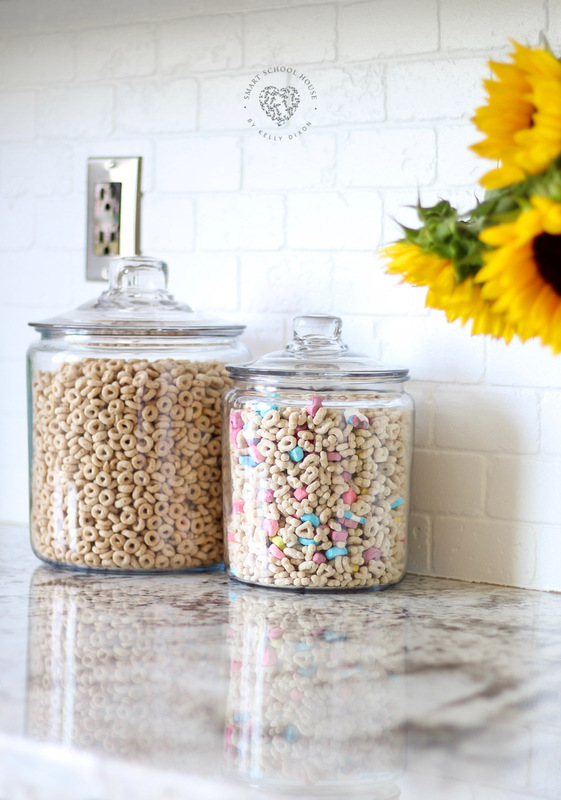 Seeing the Lucky Charms on the counter each day will help them feel excited and happy in their kitchen, and that’s all I’m aiming for. It’ll make a fun childhood memory! Plus, I think it adds a child friendly energy to our kid friendly home! (I should take pictures of the new living room decor next! –> jots that down). When we renovated our kitchen, we upgraded our lighting, which included the pendants over the island. 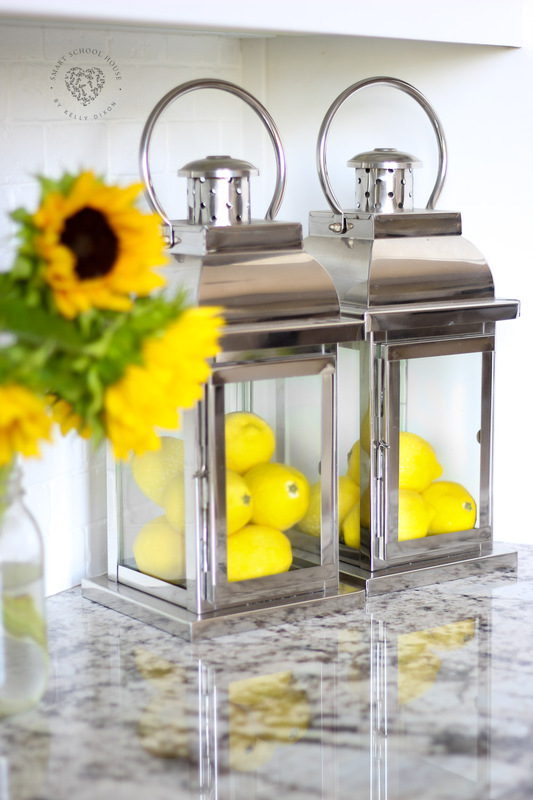 Those pendants are also chrome, so I filled these lanterns with some lemons and placed them on the counter in the corner near our microwave. I can change them lemons out for pine cones, ornaments, pumpkins, or anything else throughout the year! Next to the summer sunflowers, I think the lanterns are just perfect! I’ve never seen lanterns like this used as kitchen decoration, which makes me like it even more! I look forward to sharing the before and after pictures of our full kitchen renovation soon! Let me tell you, it’s a BIG change! The kitchen is only 10 years old, so everything was already in great condition. However, with a few minor (and not so minor) adjustments, it looks like an entirely different place!